Fed up with dating after a disastrous setup, the only thing Hayley wants to snuggle up to is a box of made-to-order chocolates from plus-sized, plus-mouthed chocolatier Bessie Winthrop. But when Bessie is found dead in her kitchen, only Hayley suspects that Bessie's "heart attack" might actually be a candy-coated murder. ©2014 Rick Copp and Holly Simason (P)2014 Audible Inc. The whole idea of chocolates with cat hair grosses me out. Story was OK. A good addition to the series. Nicely narrated cozy and well written! 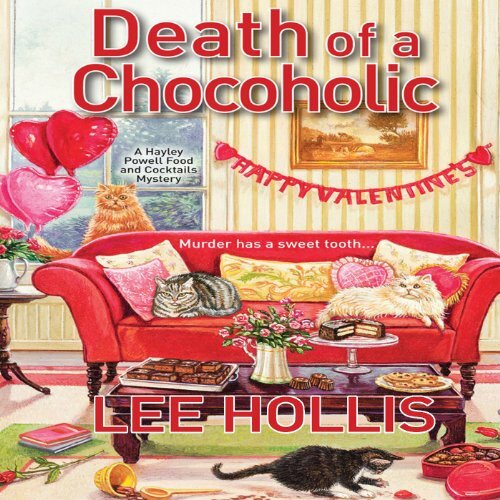 Would you listen to Death of a Chocoholic again? Why? Yes, it was well done and I like seasonal cozies. What other book might you compare Death of a Chocoholic to and why? I've been an avid listener of this series & I enjoy it a lot because it's a cozy mystery but it also has separate side stories included in it from Haley's newspaper column. I enjoy the break from the main plot to hear a story & get a recipe or two! It's a fun little combo. If you're like me and enjoy this format I recommend the "Books by the bay" mysteries, because that too has similar side stories inserted in. I only have one qualm with this installment. I wish this book would just make the love interest slightly more realistic. A new handsome eligible bachelor came to town & every woman wants him. Of course Haley meets him once, breaks into his office, accuses him of murder & yet he still falls for her... It's just written hastily as if the author needed a new love interest when Lex left town & so she threw a new guy in. However I'm interested to see how the ending picks up in the next book as it was left with a bit of a "cliffhanger." Overall a good listen! Love the series and the recipes. Stories interact. I play and can work while I listen! Better story, much better performance needed...every male character sounded the same with terrible accent! What could Lee Hollis have done to make this a more enjoyable book for you? It was very boring, so I don't know what could have made it better! All male characters sounded the same & had unauthentic accents of some type!